Send the form in to the attention of GHHMS PTSA with cash or check payment. Make checks payable to GHHMS PTSA. These items are all ADULT sizes. Ornaments are now on $ALE for $5.00! Accepting orders for these and other clothing items until Wed Nov 7, 2018! Next group order will take place sometime during Spring 2019. We have a small supply of Tshirts, bottles, decals and ornaments throughout the year. To inquire availability email us at ghhms.ptsa@gmail.com. 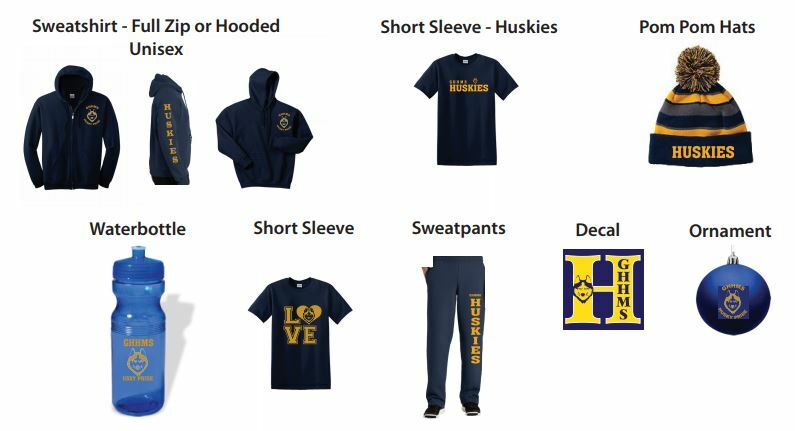 All proceeds of the Husky Pride Spirit Wear will support student field trips, enrichment programs, cultural arts events, teacher appreciation, team grants and so much more. Purchase your Spirit Wear today!